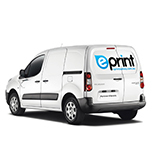 Our car stickers are digitally printed on One Way Vision adhesive Vinyl with UV inks and are printed in Brisbane. We do not offer an installation service on this product. Measure the widest and longest area of your window and add 50mm overhang. Add your dimensions to this web page and upload your file at the bottom of this page. Move your car into the shade and wait for your window to cool. Wash your windows and then apply soapy water to your window. Leave the soapy water on the window. Peel back he backing sheet and apply to the soapy water. Use 2 people when dealing with large stickers. You will be able to move the sticker into possition while the window is still soapy. Once you have positioned the sticker to the correct place allow to dry before cutting off the excess sticker with a sharp stanley knife. Come in and look at our Sticker samples at 2/101 Newmarket Rd Windsor Brisbane.